Baan Makham, Bang Nampheung A country resort in outer Bangkok situated on the Bangkrachao river bend, an area known as the “green lung of Bangkok”. 1) From the Industrial Ring Road – take Sukhasawat Exit – turn into Soi Phetcha Hueng 26. Continue on this road which is on the way to Bang Namphueng Market then turn left into Buaphueng Pattana Road. Continue on the road and cross the bridge in front you will find a parking lot on the right side. Park here then rent a bicycle or walk towards Bang Namphueng Community Moo 2 around 300 metres, you will find Baan Makham on your left-hand side. a. Ferry which is large enough for you to bring your motorcycle or bicycle. The ferry service starts early in the morning up to 21.30 hrs. at night. The pier for this ferry is right in front of Bangna Nok Temple, named Wat Bang Na Nok Pier. After getting off the ferry turn left and look for the sign “Baan Makham”, follow the sign for approximately 700 meters or you can rent a bicycle and ride to us. b. Small long-tail boat which can be hired from the pier on the right side of the ferry pier. Tell the boatman you want to go to Moo 3 Bang Namphueng. After getting off the boat turn right and follow the sign “Baan Makham” for approximately 300 meters you will surely find us. • Please check in before 18.00 hrs. 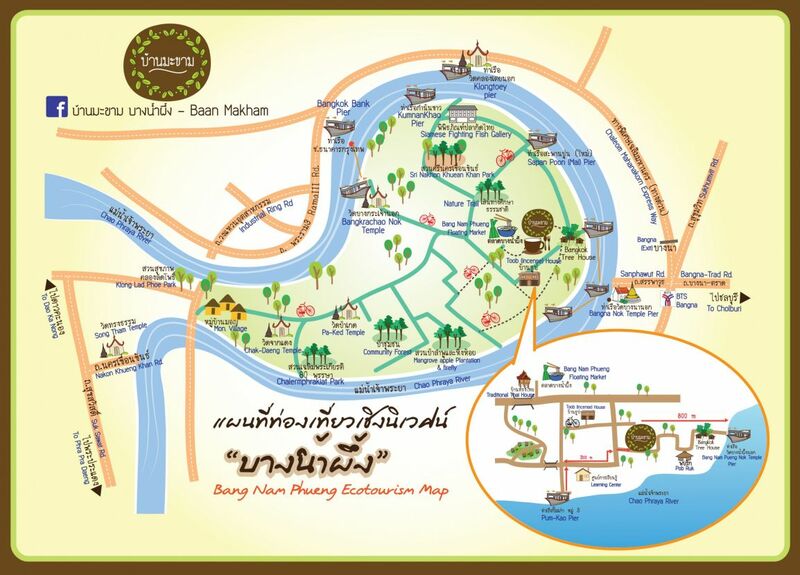 • Please notify us of time of arrival so that our staff can assist you on how to find us and be on hand to welcome you to Baan Makham. • Please notify us of the number of bags so that we can assist you with the right size of cart. Most of our neighbors are private houses belong to the natives of Bang Krachao. Some open their residences for homestay accommodation while some still preserve the traditional way of life by making and selling incenses, handcraft goods, herbal balls for massage and herbal soaps. • Cycling – Bang Krachao is well known as one of Bangkok’s best places for cycling both for amateur and semi-professional cyclists alike. From Baan Makham one can cycle all the way to Sri Nakorn Kuen Khan Park which is a park famous for bird watching. • Siamese Fighting Fish Gallery – The only one of its kind in the world with a wide variety of live fighting fish on display. • Herbal Incense Village – Learn how to make traditional Thai herbal incense at Baan Thupe. • Tie-Dye – At the Incense Village you can also learn how dye materials using the tie-dye technique. 2019 www.baanmakham.com all right reserves.